Timeless, versatile, musical and beautifully made in a very classic handmade style it’s a welcome reminder that not every modern electric guitar has to be a clone of a past design. Design, build, sounds, feel, playability. Beautifully weighted and hugely comfortable. It’s no cheap date and bigger frets and a more conventional finish might broaden its appeal. George Lowden actually made his first electric back in 1969 but not as a professional guitar maker: that came nearly a decade later. “That’s right, the first one I made as a professional would have been about 41 years ago,” George considers. “It’s something I never thought I’d do again; it wasn’t on my mind. It was actually [Lowden user] Ed Sheeran who gave me a bit of a nudge. It’s the way these things often work. Professional players, famous or not, the interaction between them and myself is really important. Sometimes ideas that would sit on the shelf get taken down and dusted off and that’s what happened here really. It’s to Lowden’s credit that the resulting GL-10 is far from yet another ’Burst imitator. Yes, it’s a single-cutaway and has twin humbuckers, an inset tune-o-matic- style bridge and a three-way toggle switch but that’s where any resemblance ends. It’s designed around a 630mm (24.8 inch) scale, standard on Lowden’s S-style, and placed between industry standards, Gibson and PRS. The neck style and headstock is typical Lowden - a five-piece laminate construction consisting of three pieces of mahogany, the centre piece quarter-sawn with quite a flamed back, separated by two rosewood strips approximately 2mm thick. It’s topped with a Gibson radius ebony fingerboard with edges bound with an inner light coloured wood and ebony outer strip. Dot markers are optional - again like their acoustic instruments, the ’board is left bare with only small pearl side-markers for position reference although, oddly, there’s only one dot at the 12th fret. The frets fall into the small camp, beautifully installed, as you’d expect, approximately 2.1mm wide and just under 1mm in height. It’s a solid sandwich construction with a mahogany back approximately 24mm thick and walnut top (one of three offered), with thin rosewood veneer in between, creating an overall depth of 42mm that tapers to approximately 29mm at the thinnest edge by the strap button. 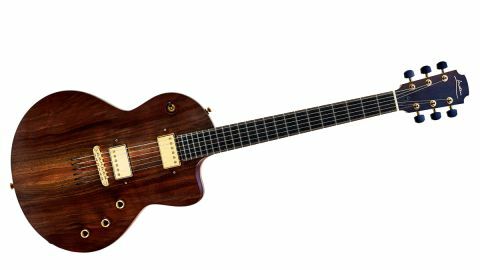 The overall weight is good for the style, which isn’t surprising bearing in mind the thinner-than-Les Paul construction, and although the back is flat there’s a subtle ribcage chamfer and a more sizeable chamfer where the body flows into the neck heel. The neck joins in classic style at the 16th fret, the flat cutaway - almost at right angles to the neck - again has some light chamfering and altogether this creates extremely easy access to the top frets without the classic heel bulk of a Les Paul. The hardware and electronics are equally considered with a real low profile feel: the tune-o-matic is recessed into the top of the body, the strings flow back some 65mm before they disappear into the body (the holes are brass lined) and are anchored into an inset brass sustain plate on the back. There’s a neat installation of the humbuckers, which appear to be placed directly into the top though there are small ears around the adjustment screws. “When you unscrew those small plates you get access to the pickup height adjustment - the screws you see aren’t actually the height adjustment screws. I didn’t feel like using plastic pickup surrounds on this guitar - I wanted it to be as clean and natural as possible,” George explains. The toggle switch is shoulder-placed, then we have individual pickup volumes and a lower master tone, the output jack, and a screwed-in Tele barrel-style just fits on that thin lower side. The control cavity cover appears to be walnut and almost looks like a piece of marquetry in the way it’s recessed into the mahogany back. The only problem is that it’s such a tight fit we couldn’t remove it to view the internal electrics. Okay, so the GL-10 is a single-cut but it certainly doesn’t feel like a Les Paul. The body’s thinness, enhanced by the curved top and relative thin edges, along with the low profile height of the hardware and pickups creates a stealth-like feel that disappears played seated or on a strap. Unusual, yes, but surprisingly practical, not least with its good weight and conventional strapped-on feel. The unique feel continues with the neck with a spacious feeling flat-ish C profile - 21.7mm at the 1st fret, 22.9mm at the 12th - that really does feel more like one of Lowden’s fabulous acoustic builds. Again though, it does feel rather different to your Strat or Les Paul. The set-up is low, the frets certainly feel like a vintage small acoustic gauge, which makes big bends less easy than on a ’board with bigger, taller wire but, again, it all begins to create - or certainly add to - the unique feel and style of the guitar. Amped, and swapping between the GL-10, a PRS McCarty and a Knaggs Kenai, the Lowden emerges in this well-proven company with its own voice. It possesses less low end than either of our references but covers a wide range of voices, not least if you use the volumes which, pulled back, reveal a beautiful chiming clarity that’s got a little Fender about it or, in mixed position, some Gretsch. In this sound setting it would be a superb tool to augment other acoustic instruments. Likewise, it proves more than good for cleaner soul or pop styles, mixing nice funk with ringing jangle. With the volumes full up it loses a little of that clarity and there’s a touch more grunt that certainly works hard for crunchier rhythms and full but clear sounding leads. It reminds us of the guitars Rick Turner built for Lindsey Buckingham in that it’s not meant to replicate a classic benchmark voice yet remains hugely engaging and for the creative musician can cover a surprising amount of ground. It’s a hugely musical piece that could excel for those of us swapping acoustic and electric in a set, picked, strummed or fingerstyle - it really sounds top dollar and loves pedals too. In many ways it’s a blank canvas and the combination of both the pickups and their beautifully balanced and graduated controls could be just the sort of piece for the singer-songwriter or sideman to embrace. There’s something, too, about that smooth, slightly compressed sustain that would appeal to the slide players among us. There’s plenty to like here for the musician that not only appreciates the craft of the luthier but has the imagination to colour and shape sounds. It’s far from a showy piece that seems to perfectly suit those goals: a real guitar player’s guitar that effortlessly glides through virtually every style you can muster. Slightly bigger, taller frets, perhaps as an option, could easily broaden its appeal yet, as is, the smaller wire here really somehow fits the vibe.